The Cold Pro™ Commercial Kit is the perfect solution for busy cafes and roasters who want to take cold brew coffee to the next level. No more mess, No more waste caused by unsaturated grounds and no more batches lost due to ruptured bag filters! Brewista proudly introduces the Cold Pro™ System. With a simple (patented) lift, twist and drain design, it eliminates the mess, waste and frustration that come with most commercial cold brew systems. The new integrated design eliminates need for adaptor ring. The open design of the Brewista permanent filter allows users to stir the grounds, reducing steeping time and preventing the waste caused by grounds left unsaturated inside a sealed bag. Brewista's permanent filter is the heart of the system. 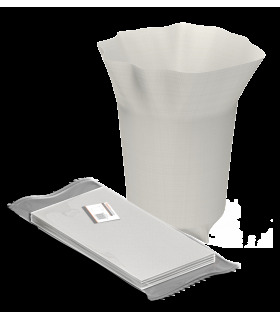 The permanent filter, made of durable, BPA free polypropylene and a photo etched stainless steel mesh can be used on its own, or together with a paper filter and/or the poly fiber finishing filter.